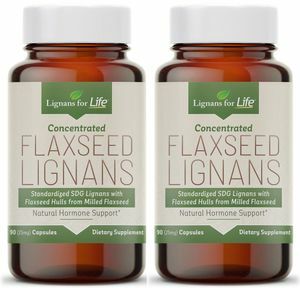 Each capsule contains 650 mg of flaxseed hulls and 25 mg of SDG Lignans. Made with 100% Flaxseed Hulls. Lignans have hormone balancing properties. Lignans are phyto-estrogens (plant estrogens) that mimic normally occurring (endogenous) estrogen. Lignans possess many potential benefits for both men and women. Lignans balance estrogen levels to help support breast health. They bind to estrogen receptors, but with less biological effect. Click here for our women's health page For men, lignans may also block the conversion of testosterone into DHT. This helps support prostate health. Many Vets and Universities recommend lignans for Cushings in dogs because lignans can reduce the heightened cortisol levels in Cushingoid dogs. What's the difference between this product and regular flaxseed? Regular flaxseed contains the embryo of the seed, where the oil resides. We remove the oil from our product so that it contains only the hull of the flaxseed, where all the benefits reside. Our product has a higher amount of lignan than regular flaxseed. Our flax seeds are chilled and cracked open in order to separate the hull from the embryo of the flax seed. The hulls are ground into a powder that is highly concentrated with lignan and packed into a vegetarian capsule.